The small hamlet of Vermillion in Ohio was incorporated in 1837. It is located on the south-central coast of beautiful Lake Erie. It is on the most southern shore of all the Great Lakes. The photographs you are about to see were taken by Pearl Roscoe between the latter part of the 19th century until 1945. Roscoe and his wife Bessie owned and operated the weekly newspaper - The Vermilion News. (ed. note: The United States Post office was responsible for "knocking the (other) "el" out of Vermilion in 1898 when there was some confusion with Vermillion Township in Ashland County, Erie County , and the town itself.) They also owned and operated a small gift shop on Liberty Avenue. That shop shared a building with the local Western Union. These photographs were reproduced by their grandson, Albert Caselton Tarrant, from the original glass plates and/or negatives between 1997 and 1998. The page is produced and written by Rich Tarrant - another grandson. Some of it (the text) comes from conversations with Roscoe's other five grandchildren and other persons in this community. The photographs and text will change with some regularity.So stay close. This is an early picture of the home of the Vermilion News. The print-shop and offices were located on the ground floor of the building and the Roscoes made their home in the tidy apartment on the second floor. This photo was taken before in-door plumbing. So if you look carefully between the building and the house on the left you will see their powder room at the rear of the structure (no pun intended). Pearl Roscoe purchased vacant land from John W. Decker on September 19, 1904. The building was constructed in 1905. This is likely the first photograph of the building taken by Roscoe. It features inset photos of what he termed "The Force" ~ Left to right: E.T. Bottomley, Hattie Thompson, Bess Roscoe, Bertha Rice, and Pearl Roscoe. The other photo is of "Our Press". It was their first big newspaper press. Originally the presses were gasoline driven. There was a gas engine in the back. A belt from the wheels of the engine ran through the building and drove the wheels of the presses. Later all the presses were converted to electricity. Both the building and equipment remain in tact to this day. It is located on the east side Grand Street between Ohio Street and the railroad tracks to the north. This picture predates the picture of the building I orginally had on this page. That particular picture must have been taken in 1916 or 1917 after electricity powered the presses and the linotypes were added to the shop. These are the folks who inhabited the apartment above The News. Pearl, Bessie, Ella,and (the baby) Alice Roscoe. The photograph was taken in the apartment. The background is some type of tapestry. Ella looks to be perhaps 5 or six when Roscoe took the portrait so it must have been taken in 1912. Ella passed away in June of 1963, and her sister, Alice, died on October 26, 2004. She lived in Stuart Florida. The Maudelton Hotel about 1911-13. This building sits on the corner of Liberty Avenue and Exchange Street. Once occupied by the local American Legion the upper floors are now idle, and is, today, for sale. This structure once occupied the southeast corner of Liberty and Division (now Main St.). It was called The Lake House and was built by a contractor named Maurice Diehl of Sandusky in 1876. In 1903 local lumber company entrepreneur George Fischer purchased it and moved it down the hill to the location seen in this photo. At that time he renamed it after his two children Maude and Elton. The photograph was taken before the Fischer Building, that now abuts the structure, was built. On the right side of the hotel you can see a walkway and steps that led into the building under the cupola. And if you look closely there's a bench where one could enjoy a summer's afternoon. The roof over the porch was used as a sun porch. And note the old "Widow's Walk" atop the structure. This is a picture of the hotel that looks to have been taken during the summer. Note the folks on the sunporch, and the children sitting by the stairs of the main entryway. Also note the dirt street out front that is now Liberty Avenue. On the left side of the hotel (across Exchange St) you can see the the building that housed the Lake Shore Electric Terminal that ran trolleys along the lake shore from Cleveland to Toledo, Ohio from about 1900 to 1938. This is a nice photo of the Lake Shore Electric taken from the porch of the Maudelton Hotel looking north-east. It was probably taken about the same time the previous photo was taken. Over the electric cars on Liberty Avenue one can plainly see the Geo.Fischer Lumber Company on the riverside. George Fischer is the same man who owned the Maudelton Hotel, and built the Fisher Building. The lumber yard perished in a great fire in 1938. This photograph is one that is (unfortunately) somewhat common about a community that is situated between two railroad companies - not to mention the Lake Shore Electric. I believe the photograph was taken (looking east) between Grand and Main streets on Liberty Ave. The building in the background is the building more recently known as The Old Prague Restaurant. This is an accident between a Lake Shore Electric train and an automobile. One ofthe worst rail disasters in the Lake Shore Electric's history, the Wreck of The Niles #152, took place just west of Vermilion in August of 1906. A great number of people were injured and several people were killed. 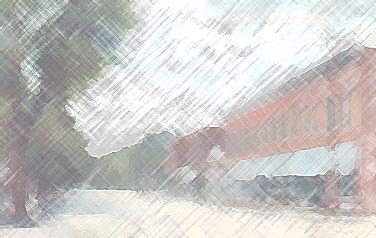 We need consider that these electric trains could travel quite fast on open tracks; so there was a lot of room for error. This picture is a "breath-taker". Englebry's ice wagon on Grand Street during the early 20th century. The view is looking east from the approximate location of that which today is the Vermilion (Bailey's) Hardware Store. The building in the background was razed during the mid to late 1960's. At the time of the photo it housed Ritter's Tailor Shop, and was also the first home of The Vermilion News. Much of the ice used to keep things fresh in homes, restaurants, and shops during the warm months was harvested from the Vermilion River during the winter, and stored in ice-houses along the river. Amazing! For youngsters who don't know why refridgerators are commonly referred to as "ice boxes" ~ it's because people had wooden insulated cabinets packed with ice to keep perishable items fresh. The ice wagon would travel throughout the town and sell blocks of ice for this purpose. A place near and dear to many hearts in the community of Vermilion for many many years. At the time this photo was taken it was Wagner's Cafe. The original property was sold by Eli S. Barnum (editors note: Judge Eli Barnum was also instrumental in the creation of the first church in Vermilion which eventually became the First Congregational), George G. Baker & Nathan G. Sherman as trustees for proprietors of Vermilion Township on April 1, 1840. A Masonic Lodge building was built in 1868. and destroyed by fire in 1870. Gaylord & Merrill built the existing building in 1870. The building housed many businesses including the post office, the Goodsell Company, the Wagner Shoe Shop and the Miller Saloon. 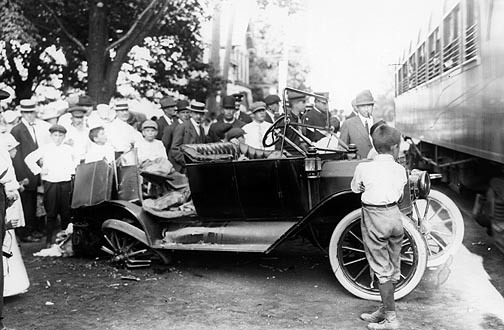 In June of 1920 Albert H. Hart brought the property from John E. Stang of Sandusky, Ohio. It was known as the Warner property and identified as lots 72-73& 74. The warranty deed is dated November 3, 1920. Albert H. Hart went into business on August 2, 1912 when he purchased a store located in the Krapp and Goodsell Building (where Lee's Landing is today). He then purchased the building on the northwest corner of Liberty & Main Streets, put in a central heating system, took out a wall in the center of the room, and rebuilt the store-front. When the building was ready he moved his drug store to that site. The second floor has been occupied by various organizations and businesses. The Masonic Lodge, the Vermilion Boat Club, and from November of 1950 to October of 1981 Dr. Norman T. Andersen DDS occupied the front rooms for his dental practice. A lady by the name of Mitzi Braun had a beauty shop at the north end of the building, and the R.E. WarnerEngineering Co. had its start in rooms that were later occupied by Louis Stoffel, CPA. The place has been, recently, re-leased, and is called The Main Street Soda Grill. They now sell sandwiches along with having the soda fountain in operation. But the day of the 10 cent phosphate and 25 cent ice cream sundae have been replaced by dollar signs. Damn, how I hate to see some things change! I applaud the current owner of the building, Mr. Dan Roth, for stipulating in his lease that the soda fountain must remain as a part of the facility. I visited this busines on 6-6-01. The folks enjoying lunch there told me that the food is quite good. I know two of the patrons quite well and I trust their judgement. This is one of the only pictures that will appear on this page that was not taken by Pearl Roscoe. 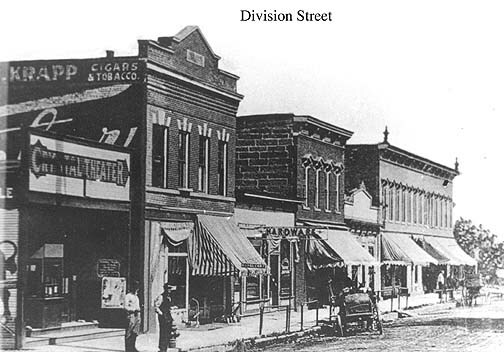 This is a postcard picture view of the west side of Division (now Main) Street looking north. It appears to have been taken on (or very near) the railroad tracks. Of particular interest here is the Crystal Theater. It was the first motion picture theater in Vermilion. All the films were silent. I would "guesstimate" that the photograph was taken between 1900 and 1905. Local resident, the late Elizabeth (Krapp) Phillips (1910-2003), owned the postcard photograph. George Krapp (the name on the building next to the theater) was her uncle, and that was his store. I thank her for sharing it with those interested in the history of our city. She will be missed. This is a rather unique photograph of the Fischer Building on the corner of Main Street and Liberty Avenue as it was being constructed in 1915. The building occupies the corner where the Maudelton Hotel stood until it was moved downhill to the corner of Liberty and Exchange Streets. At one time the second floor housed a roll-skating rink. The floor is hardwood. And when I was a tad it served as the village kindergarten. In the early 50's I watched the fisheries along the river burn from the vantage point of a window in the upstairs of the building. The lower part of the building once housed Elton Fischer's Chevrolet garage, the A&P Market,Ann's Lunch, Harry Meese Realty, Park Market (Doc and Ding Jeffery's Meat Market), Jump's variety store, Fergie's Pool Hall and Bowling Alley, and the Vermilion Post Office. This a picture I'd been promising my friend, Bill Ream, before I put this page together. It is a photo of Martin's Grocery Store on South Street that was probably taken in the early to mid 1940's. Bill and I went to school with Martin's youngest Daughter (Marlene Martin Young). Mr. Martin passed away not too long after this photo was taken, and Lou Makay (who worked for him) purchased the store. The building still exists, but is now a bicycle sales and repair place called Bicycle Bills. This is a photograph of the Vermilion Evangelical & Reformed Church on the northwest corner of Ohio and Grand Streets taken before electricity had come to the Village of Vermilion. There is an oil lamp on the corner. The photo was probably taken about 1905. Note the horse and carriage beside the church. There's a fellow in the carriage looking toward the camera. The photograph is flawed due to some scratches on the plate that can be seen as scribblings on the side of the church. I tried cleaning it up with my equipment and only succeeded at making things worse. Waxing philosophical about the problem I decided to leave such faults in the photographs. The pix are about as authentic for the time(s) they were taken as they can get. You'll see two more photos of the Church as it developed in the years following this picture.This church still stands on this site, and all of it's original structure remains. This a portrait of the same church shortly before electricity came to the Village. From the looks of the lines on the poles they were perhaps telegraph/telephone lines. The oil lamp still has a place on the corner. Take a close look at this photo and you can see the old water-tower in Hanover Square in the background, and that which looks to be a wagon parked at the railroad tracks on Grand Street. A great picture of the E & R Church taken as it was being raised to construct the basement that now houses a Fellowship Hall and a very nice kitchen. During the early part of the 20th Century the Rev. Albert C. Pretzer presided over many changes in the structure. The doors were made to swing out, the church was wired for electricity, and a new furnace was installed to replace the two wood stoves at the back of the sanctuary. A survey showed that the church was standing a few feet out in the road. Thus, it was lifted to be moved to its present location, and while they were about this task a basement was dug. Many a youngster growing up in Vermilion has spent more than a few hours in that basement each summer when Summer Bible School is in session. Here we see the H.H. Berk and Son Vermilion Flour and Grain Co.( Mill) at the southern end of Exchange and Mill Streets in 1910. W.B. Houseman was the manager. They offered "high grade Flour, Graham, Buckwheat and Pancake Flour, Bolted Corn Meal, Feed, and Grain." They ground on Tuesdays and Fridays (unless otherwise notified). Their phone number was 5. While rail traffic, telegraph, and telephone systems existed electricity was still in its early days in Vermilion. The smoke stack on the left side of the building speaks loudly of steam power. In the early hours of the eighth of August, 1916 neighbors Mabel Halloran and John Walper discovered the mill ablaze and alerted the fire department. Efforts to save the building were futile, and it was completely destroyed. Along with the bulding and machinery within it went approximately 1000 bushels of oats, between 4 and 6 thousand bushels of wheat, several hundred bushels of corn, and considerable amounts of flour and feed. Inventory records were also destroyed. Early damage estimates were at least $20 thousand dollars. The mill was built by the D. & A.T. Christmann in 1898 and was one of the town's foremost industries. It was the only plant of its kind in the vicinity. 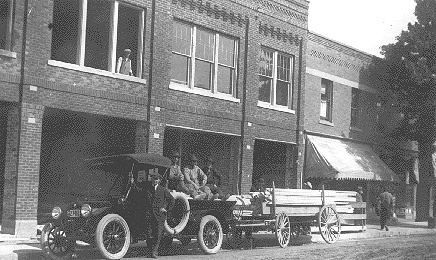 Berk had purchased the business in 1910 (about the same year as the picture), and repaired it, built additons, and installed modern equipment which allowed them to produce some of the best and well known products in the region. Origins of the fire were undetermined. Some thought that lightening during a midnight storm may have led to the conflagaration. Others speculated that spontaneous combustion due to the closeness of the atmosphere, and excessive heat may have been the cause. Today Mill Manor (a nursing home) occupies this site. This photo of the Town Hall and the old Congregational Church on the corner of Ohio and (Division) Main Streets is a real "beaut". I can't date the year of this photo exactly. There are no fire escapes on the building (they were added in June of 1908), and looking at the gentleman walking the baby in a carriage on the sidewalk I'd guess it's a morning on a Spring day about 1905. The Townhall was built in 1883. The pinnacle over the highest part of the structure no longer exists. And the wrought-iron work at the top of the building is gone.The wrought-iron still exists, and is stored in the auditorium on the top floor of the building. The following is a brief and concise history of the building. Of all the public buildings in Vermilion, Ohio there is perhaps none of more historical worth than Vermilion's Township Hall. That value far exceeds any monetary/real value of the property. And no small part of the reason for this is the fact that after 122/123 years "It's still all there: The offices, the voting room, the Opera House; and the memories". Those memories began in the year 1878 when the Ohio Legislature passed a bill authorizing Township Trustees to erect a town hall in the Village of Vermilion. In the Spring of 1882 a majority of villagers voted in favor of building the hall, and a site on the corner of South and Grand Streets was purchased for that purpose. However; due to the fact that "a majority of Township people favored a site nearer downtown" another property was purchased from Jacob Nieding and Vermilion Village early in 1883. It lay just west of the Public Square and north of Ohio Street. Township Trustees at the time were: F.C. McConnelly, N. Fischer, and Jesse Ball. Columbus, Ohio architects, Terrill and Morris, drew up the initial plans, and local builder B.S. Horton was awarded the construction contract. Of six bids for that contract his was the lowest. It was $12,500. On August 1st of 1883 construction of the Vermilion Township Hall commenced. By November 1st the Erie County Reporter stated that the building had begun to take on an "attractive appearance". On the 22nd the roof was completed. And on the 29th the land around the new building was graded for a sidewalk that would be laid along the Ohio Street part of the structure. In early December a heating apparatus had been installed in the northwest room of the building and was operational. On December 20th it was announced that St. Mary s Church would be the first organization to rent the hall to be used for a fair. On Tuesday evening, January 22, 1884 public dedication services of Vermilion's newly constructed Town Hall were held. An estimated 10 to 12 hundred well wishers from the village and adjoining towns attended. After speeches by local politicians, three tableaux were performed by local men and women on the Opera House stage. Later in the eve folks danced in the voting room to music provided by the Great Western Band until the wee hours (4 a.m.) of the following morning. The crowd was said to be so large that many in attendance were unable to dance. This experience led more than a few folks to opine that the building should have been twenty or thirty feet longer - a detail which, however insignificant it may seem is, nonetheless, quite extraordinary (historically). In any case, for the next 50 years the Vermilion Town Hall served as the literal hub of village political and social life. With a seating capacity of 352, and a Gallery capacity of 111 more than a few medicine shows, minstrel shows, lectures, plays, high school graduations, wedding receptions, and numerous other civic sponsored productions took place on the 2nd floor Opera House stage. Sundry items necessary for these productions were often hoisted by cable to the back stage door on the west side of the building. The first floor featured a council chamber, trustees' hall, voting room, dressing room, kitchen, dining room, court room, and a jail replete with six bunks. Most of these rooms, although modified for various purposes through the years, remained in active use until 2005 when township offices were moved to a new facility. Best of all it was all "paid for". Total cost for the entire finished project - property site, building construction, furnace, seats/chairs, landscaping, chandeliers, coal oil lamps, frescoing, grading, grate for office, one half cistern, sidewalks, and architects - had come to a whopping total of $16,805. For a little village of 1,090 people t'was a monumental, but very worthy, project. Moreover; the Vermilion Town Hall, as previously stated, remains much the way it was almost 125 years later. It is all still there: The offices, the voting room, and the 2nd floor Opera House. House. [ed. note]And while all this still exists; and while this was all "paid for" over a century ago with taxpayer funds; Vermilion Township Trustees ("Trustees" being an obvious misnomer) sold it to the highest bidder right under the collective taxpayer's noses for a measly $150,000.00 in June of 2006. The Congregational Church next door is a place that is near and dear to my heart. I grew-up in the church and it surrounded my life. I loved it. When the village of Vermilion began growing during the fifties the school system ran out of classrooms for the children and this church provided a classroom for them. This is where I attended 2nd grade. Both buildings still exist. The Town Hall is (as it always has been) owned and operated by Vermilion Township Trustees until this year. The church was sold during the late fifties. For a time a Baptist Church occupied the property.Today it has become a very pretty flea-market/antique store. And a footnote about the church. It had an original Revere Bell. That bell was sold to a church in California when a new church was being built. One other thing about the picture. The tree that is so prominate on the front left side of this photo gave way during a 1998 wind-storm and smashed the top of the house to the left of where this picture was taken. The tree no longer occupies this corner. But this may give you an idea of how long these Maples are apt to live. This photo is new to the page and takes the place of one of my favorites. But tis a true piece of history in Vermilion. This is Cloudy's Ferry located on the northeast side of the Vermilion River.Cloudy (Lewis Noel)transported folks across, and up and down the river for years. The happy-go-lucky French-Candadian based his service in a small shack and store just north of the Vermilion Yacht Club where he sold pop and rented boats to Linwood Park vacationers. And it's plain to see that people were attracted to his river taxi. Cloudy's original ferry was a 20 foot flat-botom boat named Gertrude. It was an open craft with benchs on either side powered by a single engine near the stern. There was always a big pile of life preservers at the stern, and a large American flag flew aft. He steered her with a rope that ran athwartship. And when he docked he would shut the engine off in just the right place, coast into the dock, and gently toss a line around a pile to bring her to a slow stop. Late Vermilion historian George Wakefield, recalled that, "One of his favorite tricks was to start the engine by rocking the boat; he would set the flywheel near the ignition and roll the boat just right and the darn De Moy (engine) would just take off like a pet steam engine." He would then dance a jig as the boat moved in a small curve to the his east dock singing as they went. When the Gertrude had finally seen her best days local boat builders, George Goetz and Jim Brooks built a new round-bottom boat called the Marry N (pictured), put the old engine in her, and Cloudy was back in business until the days of the automobile overwhelmed the ferrying trade. I enjoy this picture for a number of reasons. One can see the west pier and the Vermilion Light in the distance with two persons standing there. And the laid-back atmosphere of the people at the ferry dock is extremely palpable. This is a nice photo that was greatly enhanced by my scanner. 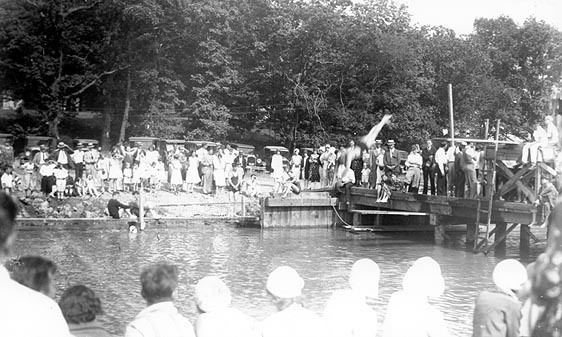 In the early part of the 20th century - when the Vermilion Boat Club started their South Shore Regatta - they also sponsored water games along the river in the area that is now recognized as Vermilion's Waterworks (along N. Main Street). The games included swimming and diving contests, as well as canoe races and water-fights. The primary participants in these events were, of course, local youngsters. The audience(s) however came from far and wee to enjoy an afternoon. The regattas were weekend events and often culminated in street dances held between the railroad tracks and Liberty Avenue on the street known today as Main (it was then Division). As is plain in this pic A good time was had by all. This is a picture of the first plane to land in Vermilion. It is coming in off Linwood Park beach. It is August 30, 1914. The original story was that it was aero-pioneer Glenn Curtiss. Later investigation on the subject shows that it is not Curtiss, but is a gentleman by the name of Tony Jannus one of his contemporaries. The plane, however, was a Curtiss aircraft. Curtiss did, in fact, fly-over Vermilion some years earlier (shortly after noon (1:58 pm) on August 30th, 1910). That flight was, to that date, the longest flight ever made by any aviator over water since the advent of the biplane. He was flying from Euclid Beach, Ohio to Cedar Point. It took 78 minutes. His average speed was 46.1 mph at a 300 feet altitude. It was a distance of 60.5 miles. And he received $2500 for making the trip. This is a photograph of the seaplane on Linwood Beach. As noted in the previous text the pilot is one Anthony "Tony" Habersack Jannus. Former Vermilion resident and historian, the late George Wakefield, told me that the gentleman on the left is Charlie Trinter, former post master and insurance agent. On the right is Lewis Englebry who ran the Englebry haberdashery on Liberty Street where the Liberty Theater was located. He weighed about 345 pounds. Jannus flew to Vermilion from Sandusky at the request of the Vermilion Fire Department. It was an attraction for a firemen's convention being held in town. When Jannus flew back to Cedar Point (in Sandusky) he took Englbry along as a passenger. To that date Englebry was the heaviest (known) passenger to ride on an aircraft. In the background one can see the old Vermilion Lighthouse. Tony Jannus has the distinction of being the first commerically scheduled air pilot in the world. About the same year this picture was taken (1914) he flew round trip flights from St. Petersburg to Tampa, Florida for a company called the "Airboat Line". On October 12, 1916 (at the age of 27) he was killed when the plane he was testing (a Curtiss H-7) for the Russian government crashed into the Black Sea. His body was never recovered. This is a rather unusual Roscoe photograph (new to the page) for several reasons. For Roscoe didn't take many color photos. 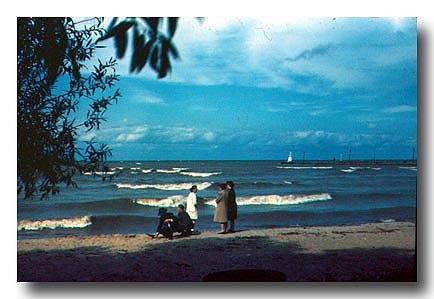 Taken toward the end of his life this pic of Main Street Beach is a very familiar scene to both Vermilion residents and visitors. It, of course, was taken long before the Army Engineers built the breakwall across the harbor entrance. And by the looks of the folks in the pic - their dress - and the waves and skies one can only assume that it was likely captured during the very last days of autumn sometime in 1942. Unfortunately, some good souls thought it was an eyesore and had it removed last year (2005). They could not have been youngsters who grew old with it. This is a photograph of the Great Flood of 1913. The two-masted sailing vessel rests along the western bank of the Vermilion River. The late Local historian, George Wakefield (1910-2001) informed me that the vessel sat along the river at the foot of Main and Ferry Streets . In the upper left of the photo one can see the old Lake Shore Electric bridge on the skyline. And if one looks real close a part of the old river bridge for horse carriage traffic can also be seen. Fish tugs can also been seen moored along the river bank going to the bridge. The January and Spring thaws can be treacherous times along this river. The riverside restaurant popularly known as "McGarvey's had its humble beginnings in the early years of the 20th century as a very lucrative bait and livery shop owned by a family named Showalter. Originally the seasonal operation was located on the east bank of the Vermilion River just south of the current bridge. In 1925 a couple by the name of Helfrich purchased the operation and property from the Showalter heirs and promptly concentrated their efforts on building a restaurant business. They specialized in preparing and serving chicken, fish, steak, and frog-leg dinners. It became an extremely popular eating place for both visitors and residents of Vermilion, Ohio during the summer months. In 1929 when a new (the current) river bridge was constructed, and the old one demolished Mr. and Mrs. Helfrich erected a new building just north of the bridge and equipped it for an up-to-date summer and winter restaurant and boat house. Several years later When Mr. Helfrich's health began to fail his son-in-law, Jesse Hamman, of Lorain, came to Vermilion to assist the Mrs. with the business. Following Mr. Helfrich's death he continued as manager of the restaurant. Then, when Mrs. Helfrich's health began to fail, Hamman entered into a co-lease with a man named Andy Dambach from Milan, Ohio. Mr. Dambach was an experienced restauranteur who also operated a restaurant called Andy's Place in Milan. The co-lease operation began in 1936. In 1938 a Sandusky man named Charles Charlie McGarvey purchased the restaurant from Helfrich, Hamman, and Dambach. McGarvey also had a restaurant in Sandusky called "MGarvey's". But it wasn't until 1939 or 1940 that he officially changed the name of the Vermilion restaurant from Helfrich's to McGarvey's By this time the bait and livery part of the operation had been abandoned and the eatery was quickly building a regional reputation for both its food and ambience - as a pleasant riverside cafe. After Charlie McGarvey's death in 1944 Charles "Charlie" Solomon and a partner purchased the restaurant for $35,000. A year later they were offered nearly twice that amount for the business. The quick thinking Solomon bought out his partner and set about learning the business. Although it was said he was good in the kitchen but not so good with the customers - his wife was good at both. And for the next forty-five years the restaurant - which kept the name McGarvey's - was successfully owned and operated by the Solomon Family. In the Spring of 1989 the restaurant was sold to a restaurant chain known as "Tony Roma's A Place for Ribs". But lacking the expertise and loving touch of either the Helfrich Family, its namesake Charlie McGarvey, or the Solomon Family the eatery never regained public favor. In May of 2000 the Vermilion Port Authority purchased the property for $985,000 and the old restaurant was razed to provide additional dockage, and make way for a new restaurant called The Red Clay on The River. McGarvey's (Boat Drive-in) / Helfrich's Restaurant was, beyond the shadow of any doubt, one of the most unique and visited spots along the southern coast of Lake Erie for nearly three quarters of a century. For most folks who were fortunate enough to have known the place through the years many fond memories remain. That certainly doesn's seem like much. But, perhaps - in the bigger scheme of things - it is what really counts. A new addition. The Vermilion light on the West Pier taken during what appears to be a "Nor-Easter" blow. The picture was taken from Linwood Beach looking west. The flotsom and jetsom rolled right in on the beach, and Erie must have roared. Those who visit the Great Lakes Historical Museum at the foot of Main Street can see a replica of this light. But this is the "real" thing. Okagi's restaurant on Liberty Avenue in downtown Vermilion in the 30's. A well known dining spot frequented by many people from Cleveland, Pittsburg, and other areas.The menu was quite extensive and frequently altered.The tables were dressed with cotton tablecloths and napkins.The fare was American.The front of the restaurant was a glossy black and white tile. This photo was a rainy day photo. You can see the reflection of buildings across the street on the tile facade. Today this structure is split to house two shops. One currently (4-06-08) houses a small banking firm and the other side is empty. And now a bit of Okagi trivia. Mr. Okagi's first name was Mamouru. I have been told that Okagi's wife was the true restaurant manager. Folks who worked at the restaurant told me that she used to stand by the door where the waitresses would take out the bowls of food to the customers (keep in mind that it was home-style service ~ one did not get individual portions ) and she'd stick her knuckles in the mashed potatoes to make sure they were warm before they got to the tables. He and his wife raised two orphan children ~ a girl and a boy. The girl's name was Mary Kenik. Her father owned a shoe-store on Grand Street. She eventually married a fellow by the name of Russell Vasbinder. The boy they raised was named George Kominis. He became a pilot in the mililtary during WW2. Afterwards he became a commericial pilot, and had a very succesful career. Mary's husband, along with another fellow by the name of Cecil Thomas (Mary's brother-in-law) bought the restaurant when Okagi decided to leave town. Mrs. Okagi, who was French, committed suicide in the garage of their home on Exchange Street. She had terminal cancer. Mr. Okagi died at the age of 78 on Sunday December 23, 1956 in Los Angeles, California. Another view of the Okagi Restaurant taken about the same time as the previous photo (circa 1930's). I note that when WW2 broke out the federal government came in and closed the restaurant investigating how Okagi spent his profits. Okagi lived in the United States but never became a citizen. Everything checked out and the restaurant was re-opened in 24 hours. Of further interest is the Leidheiser Grocery store next door, and the building next to it. The grocery appears to have been part of another establishment prior to its construction by the looks of the facades of the building. And while I haven't used my magnifying glass just yet I believe the building next to it was also a Leidheiser establishment. Beyond all that I especially appreciated the pooch in the foreground. That was old Vermilion. Across the street and a bit to the west of Okagi's was the White Inn restaurant. This was a working man's eatery. The fast-food industry of the time. Short-order burgers, fries, steaks, chops, and fish. In the morning it was pancakes, eggs, bacon, sausage, and toast. Tom Williams (a prominent attorney who also served as Postmaster) was my Sunday School teacher during the 1950's - and used to treat the class to a pancake breakfast here on occasion. Today both the Inn and the house that stood between George Rathbun's General Store(on the east) and that which is now the Old Prague Restaurant today (on the west) have been razed and paved over for parking. © 2008 - Rich Tarrant / Vermilion Views Inc.